With the hundreds (or is it thousands now?) of panels and presentations at SXSW Interactive in Austin this week, job one for any journalist is trying to turn what could easily become a dart throwing scheduling exercise into some kind of coherent strategy for coverage. Looking over the sessions catalogue again this morning for something I might have missed, the name Gary Shapiro caught my eye. It would be great to get his read on SXSW– and see how a prominent player at a more established association/trade event– one that all our readers know– views the tech frenzy that is SXSW Interactive. And in a sense SXSW Interactive is a kind of CES for millennials and companies who want nothing more than millennials’ eyeballs. That it’s an event for end users of technology as much as for vendors is as important a distinction as the generational one. 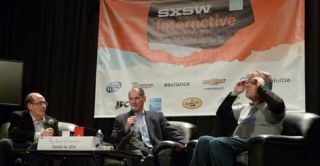 Left to right: moderator Kevin O'Malley, Gary Shapiro, and Robert Scoble, at SXSW Interactive on Monday. If you’re reading this, you know that Shapiro is the indefatigable president and CEO of the Consumer Electronics Association (CEA), the association that of course produces the huge CES show each January. (If you’re at SXSW reading this, and have never been to the CES show, note that CES dwarfs southby in size, scope, and the presence of real hardware). And if you’re in pro AV or pro audio, or any “pro” side of the businesses from Broadcast TV to technology for education, you don’t need a lesson on how the CES– despite its name– is one of the most important trade events on the planet, as we’ve all seen the old dynamic of innovation coming first to the pro audio and pro video world and then disseminating to the consumer world, do a complete 180. The consumer electronics giants now funnel R&D into the consumer side first (read Smartphones and flat panel TV’s and content distribution platforms and Apps), only to have it filter into the pro side later. The consumer tail has been wagging the AV dog for some time now. And it’s not likely to change. In a Monday session at SXSW Interactive titled Top Tech Innovation Trends for 2014, moderator Kevin O'Malley, president of TechTalk/Studio, hosted a wide-ranging conversation with Gary Shapiro of the CEA and Robert Scoble, the Startup Liaison Officer at Rackspace. With an ambitious agenda to “join leading technology insiders as they share the latest and hottest trends in tech innovation, consumer electronics, services, social media and startups – and unveil a top-level view of what’s coming in the near and long-term future” the session could have quickly lost focus in vague musings about “how our lives and businesses… will be changed by driverless cars, wearable technology and computers, sensors, 3d printers, curated content, and robotics” as the session description hinted. Gary Shapiro has been an active force not just in the trade show world– with its emphasis on companies and products– but in legislative issues and in education for all things technology related. Both sides of him came out today at SXSW, as he shared some interesting ideas not so much as what he’d seen at SXSW but on what he thought were wider trends in technology that we’ll soon see everywhere– not because they’re cool but as the result of deep trends in technology infrastructure and legal and regulatory landscapes. The session started off with some fun if somewhat silly discussion of “wearable” technology. A representative from the company Switch Embassy brought out a model with a shirt featuring LED lights embedded in the fabric. Interesting. Correction, cute. Less interesting when it was disclosed that there only about two dozen shirts available from the company, at a cost of about $4K each. Yes, the technology was impressive. It was interactive, and involved not just dynamic changing of content but also the incorporation of sensors for two-way feedback. Shapiro brought some interesting perspective to the notion that one of the hottest things at both CES in January, and SXSW this week, is “stuff you wear”. He pointed out that while a shirt that you can text to is not all that intriguing, the medical and health applications of wearable technology are. “We’re using technology to solve problems, in health, in education”, said Shapiro. Robert Scoble brought up the new Bluetooth “smart beacons” that he’s seeing in products. According to both Scoble and Shapiro, this topic will be even hotter at next year’s SXSW, as we start seeing Apps that use smart beacons, such as Museum Apps that change the content on your smartphone-installed audio/video guides as you move through the building. Contextual content, is the idea. Google, Scolbe pointed out, is tweaking Android with tools that will enable platforms to “know that you’re shopping” for example. Some of these platforms will be as simple– but effective– as using motion sensors in smartphones that learn physical movement patterns. Is that new, you ask. Note, this does not involve software that monitors your calls or texts or net surfing or App use as you move. Rather it learns from your actual physical movement patterns. Shapiro talked about the larger trends that are shaping the evolution of technology from the top. Like NAB on the broadcast end, CEA and Shapiro are worried about “bandwidth” issues, as Net Neutrality issues threaten to disrupt content delivery for wired broadband, and increasingly the wireless spectrum is an area of contention. Why? Because we’re witnessing an explosion of the sheer quantity of digital content being generated. ��Content can come from anywhere now,” added Shapiro. And he is worried about not just physical spectrum/bandwidth needs, but changes in the politics of content distribution. Shapiro mentioned the Supreme Court case that is trying to determine if Aereo can legally continue to avoid paying license fees to rebroadcast content from networks like CBS, NBC, etc, as it rebroadcasts those networks’ content through its antennas, for a small fee. The Broadcasters of course call it theft. And the Justice Department agreed, but the case is now pending in the Supreme Court. Shapiro also pointed out that new U.S. law allows crowd funding, opening more user-generated content on many platforms. Surprisingly– because I like many in this industry have been disheartened by the disappearance of HiFi and the dumbing down of audio for years– Shapiro predicted a new shift going forward, a return to the idea of high fidelity in Audio. “From the CD, to the MP3 era, we went down in audio quality” Shapiro said. “But a lot of research shows that audio quality is even more important that video for the immersive experience”. Shapiro called out a new product that is to be announced/demo’d at SXSW tomorrow (Tuesday). And from what an unexpected source. Neil Young is speaking at SXSW Tuesday, and is expected to unveil his high fidelity audio brainchild, a high-quality music service called Pono. Hearing Gary Shapiro speak today was a nice addition to SXSW– and tie-back to issues we in the pro audio, pro video, and more established industries are keyed into daily. And high end audio at SXSW– who would have thunk it? I for one can’t wait to hear what Neil Young– an artist who has never compromised his vision on the alter of commercialism– has to offer all of us who pursue technology not for technology’s sake but for what it brings us and the places it takes us. OK, well, sometimes for technology’s sake. There’s wonder in there, too.